Simple yet stylish, these attractive return address labels will remind you of rolling green hills and valleys far from the dirty distractions of the city. It's a straightforward selection that will liven up your letters and packages with a polished look that is perfect for both personal and professional mail. If easy-going is what you want - this product is a smart move. You'll never have to scribble out your return on another envelope as long as you have these convenient self-adhesive labels around. Just stick them on anything you put in your mailbox. 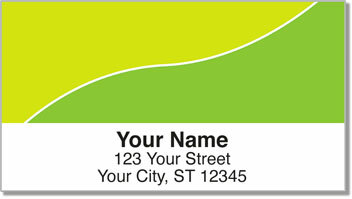 Get your very own Green Graceful Line Address Labels now! Other color options are available, and don't forget to add a matching personal check design.